In my last post I talked about the debate between the disease model and the choice model of addiction. I argued that you need to understand a bit about the brain in order to make sense of choice in the first place, and I reviewed some of the changes in the brain brought about by addiction — changes that make it more and more difficult to choose NOT to go after the thing (drugs, booze, Facebook, whatever) that you are addicted to. But now I want to go deeper into the issue of how we make choices. This seems so important to the topic of addiction, in general, and to the immediate question: how do you tell yourself NO? A current article in NatureNews (a science publication for the general public) reviews some recent neuroscience experiments into the nature of free will. What is free will anyway? We generally assume that we make choices out of…well out of choice. We decide, we are the decider, we are the ones who choose what we do and what we don’t do. (In which case, addicts must be real idiots!) Yet neuroscience tells a different story. There are activation patterns in the brain that foreshadow what we are about to choose, seconds before we actually decide. In a new version of a classic experiment, Bode and colleagues (2011) asked participants to lie in an extremely powerful (fMRI, 7 Tesla) brain scanner. They were told to push a button on a joystick either on the left or the right, whenever they felt like it. Meanwhile, a stream of letters went by on a screen, changing every half-second. As soon as they pressed the button, recently displayed letters appeared in a new window. Now they were asked to select the letter they saw precisely when they had DECIDED whether to press the left or right button. The results? Activity in the left “frontopolar cortex” (at the very front of the prefrontal cortex) predicted what decision they were about to make, several seconds before they were aware of making the decision! These results suggest that the moment of choice is not free at all. It is already determined by events in the brain. The debate between free will and “determinism” has gone on for years (in fact it started way back in the 18th century, with philosopher David Hume). But the science that shows us the nature of determinism has become more and more sophisticated. Now it is hard to refute the idea that choice is a moment in a stream of biological events. It is never entirely “free”. Maybe this should not be surprising. After all, if our brains didn’t fall into a specific pattern before choosing whether to turn right or left, whether to have a cookie or an apple, whether to buy heroin or turn on the TV, then where would the decision come from? It has to come from our brain — from our very own brain, with all its cravings and preferences — or else where would it come from? It wouldn’t be ours if it didn’t come from our brain. And brains take time to do things. So it may not be so weird to think that changes in brain activity precede the moment when we are aware of making a choice. If you follow that argument, then the difference between deliberate choice and addictive (compulsive) choice isn’t easy to pinpoint. 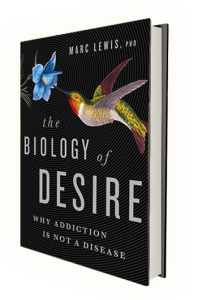 In which case, what should we do about our tendency to make addictive choices? Just sit back, give up responsibility, and take the consequences? No, there’s a better answer! The closest thing to free choice, says emotion theorist Nico Frijda, is to insert moments of reflection into the stream of impulses going on behind the scenes. Our brains include the machinery to reflect, as well as the machinery to act impulsively, and brain changes preceding moments of choice can call upon both. If you relax, sit back for a moment, even meditate a bit, the short-term gains of addictive behaviour start to pale next to the long-term gains of getting and staying abstinent. Yes, it’s all happening in your brain before “you” make the choice, but you can guide your brain into activation patterns that are not ruled by habit and compulsion. And the more often you do it, the easier it gets. You must be familiar with Ronald K. Siegel’s 1989 book Intoxication. He argues that the drive to intoxication is the fourth human drive, but it’s also a basic drive for many other species. We’re not alone in the animal world in our desire to get stoned. When an elephant ‘makes a decision’ to eat the fermented fruit then staggers around in a drunken stupor, the same processes must be going on in his brain as the ones that preceded my decision to have a rum and sambuca last night. I teach sociology at a small community college on Vancouver Island in British Columbia but my interests have never been specifically sociological and I started my career studying ethology. The issue of free will is never far from any of my classroom discussions. My daughter the evolutionary biologist argues that sociology is just a branch of evolutionary biology anyway, but I don’t think I follow her all the way down that argument path. I definitely feel that ‘social solidarity’ or our need to belong to our life-giving groups trumps rational decision making most of the time. Randall Collins makes that argument in his book Sociological Insight: An Introduction to Non-Obvious Sociology but so do many other brilliant thinkers over the decades and centuries even. In any case, I think that Siegel has a bit of a problem when he goes from discussions of intoxication to addictions. They are different but related. You seem to be more comfortable in that discourse than Siegel, but I’d like to know what you think about Siegel’s work. As an aside, the fact that he uses animals in his research doesn’t endear him to me. But that said, I think he’s contributing to a paradigm shift in thinking about intoxication and addiction as you are. Thank you. I’m definitely buying your book and getting my library to do the same. Thanks for such a thoughtful comment. I’m not familiar with Siegel’s book on Intoxication, but now I’ve got my homework assignment. I do indeed think there is a big difference between addiction and the urge to become intoxicated. Interestingly, one can get intoxicated by anything from oxygen depletion (e.g., holding your breath too long) to drugs that specifically mimic the dopamine drive system, drugs like coke and methamphetamine. So there are drugs that directly trigger a kind of excitement that is very much like the heart of addiction. Ironically, perhaps, opiates also trigger dopamine release directly, by inhibiting the “brakes” that hold back dopamine release from a brainstem nucleus called the ventral tegmental area. So opiates also activate the machinery of addiction quite directly. What all this seems to mean is that there is overlap between the attractiveness of certain drugs and the “attraction” that becomes an incessant compulsion when you’ve become addicted to something. Yet other drugs, such as dextromethorphan or nitrous oxide, are attractive, seemingly, just because they get you out of your mind. If you buy that, then I think it makes sense that animals are drawn toward intoxication but not addiction. Addiction seems to me like an accident waiting to happen. Like a bad back or depression, both of which seem to beset many people just because of the vulnerabilities built into our skeletons in the former case and our brains in the latter. Or, more accurately, built into the interface between these biological structures and the world we now live in. So why do animals want to become intoxicated? Perhaps because it’s a relief from the anxiety of being alive. Just being “not-self” for a while must free us from the anxieties of trying to protect and defend ourselves from harm. But I can’t help thinking about the “Rat Park” experiments conducted by Bruce Alexander, a fellow British Columbian, in the early 80s. I get to this in Chapter 13 in my book. Alexander found that rats preferred morphine solution to water when housed in normal steel cages in isolation, but when they were housed communally in a nice big wooden pen with lots of rat toys to play with, they drank less morphine and more water. So even intoxication lost its appeal when these rats had the opportunity to play. Maybe that’s what you meant by “social solidarity”, but I’m not sure. There seems to be an attraction to being with others of our kind that rivals that of intoxication. Anyway, I’ll get to the Siegel book and see if I can get more insight into why elephants like getting drunk. It’s such a compelling image! Thanks again for the thoughtful dialogue and for your enthusiasm for my book. As I listen to Adele in the background, I think how she was influenced by Amy Winehouse. I don’t comment in newspaper comment sections (anymore), because of so many people who are so angry and judgemental. But so many were so hard on Amy. I don’t think she was Tony Bennett, but she was a fine singer just the same. With many mental health issues. Anorexia? Manic Depressive? Difficulty with success? Any comments in general about addictions and celebrity? Secondly, and I mean this, you are a fine writer! I think you could have a career in fiction, you are an excellent story teller! I’m slowly savouring your book, and have talked about it with my analyst. “Further evidence that the world was not only dangerous but incomprehensible”. How many times do I talk to my analyst for support, asking him…why? Why did someone treat me like that? Like you say, the world is incomprehensible at times. Hi Dave. The warmest possible feeling comes from the image of someone using a line from my book to gain perspective or insight. Well, yes, it is often just so incomprehensible. But the flip side, for me, was and still is the ongoing search, the mystery and magic of finding meaning in life. Maybe that sounds trite, but I mean it. I came back from my book tour in Toronto quite depressed. It had been two weeks of unexpected glories, interviews and accolades, and now it was just me, waking up, getting the kids dressed, doing the dishes, and then what? Now, two weeks later, I feel good again. Just the the sun on my skin and the chatter of my children mean everything. I still can’t figure it out, of course, but the incomprehensibility seems like an adventure rather than a curse. Regarding addictions and celebrity, I haven’t thought much about it. But maybe that week of depression when I got back from my book tour gave me a taste. I’m no celebrity, but I felt bigger than life for a little while, and returning to the mundane was pretty difficult. During that week I drank more than usual…that’s the gauge of my addictiveness these days. Maybe real celebrities have to cope with that roller coaster ride every single night. I think that people with addiction problems are fighting battles that are just too difficult for most of us to endure. Welcome! It’s nice to know that someone here in the Netherlands is joining the dialogue. Sorry, I should say here in Europe. At 63 I have always thought and often said that most people have no idea how strong an impulse can be. Reading your book I get the idea that it might be due to how much juice the impulses can pull from the most primitive levels of emotion. To me my dACC faced a cyclone that just tossed it aside like a leaf if I were to adopt your terms. It is true that we can “reason” with our impulses sometimes and restrain them if they are milder but otherwise not. To me, Fury has to be understood. I wonder if it is not Fury that makes us most Human, me at least. Well said! I agree: people can’t imagine how strong impulses can be until they are swept away by them. Whether you do it or whether you control it is often a finely tuned tipping point. On the side of the dACC (a cortical centre for self-regulation, conflict monitoring, selective attention and inhibition), we stack up future rewards (it will be better in the long run) along with moral pronouncements (What kind of a person are you?!) and recriminations or warnings (You’re going to be so sorry!). But as you say, they can all be tossed aside like a leaf in a cyclone by the intensity of the drive to DO IT — geysers of dopamine coursing through circuits that have overtaken much of the ventral prefrontal cortex. So what do we do with intense impulses? The brain-based picture helps us to understand impulsivity (and its close cousin compulsivity), but it doesn’t give us clear answers about how to live. Should we forgive the drug addict? What about the child molester? Should we forgive ourselves for hurting ourselves? What about for hurting others? Recognizing the power of impulses is a crucial first step in this exploration. And you mention “fury.” I’m familiar with that as well, but mostly as directed at myself. This is what I have here. 1. The difficulty with the impulses seems to be that they arise from the core of authenticity you associate with your identity. They are not just super powerful but they “feel right”. For me this perception cancels the mediations of the PFC. If one were to imagine a choice that did NOT arouse overpowering emotional associations then the PFC might do a terrific job of weighing the alternatives. One might even believe in free will under the circumstances. There would be little or no emotional loading of action potentials. 2. I once read an account of a case where the subject sustained a head injury the result of which ( the author supposed) was that the person was physically severed from his emotions. His decisions and choices were not emotionally based. I would like this experience – not 100% separation but perhaps 75% just to pick a level then perhaps 100%. Maybe a person would have no motivation at all but does a being with extensive rational capacity REQUIRE an amygdala to proceed in some sensible fashion? I am not sure. 3. I think it was Nietzsche that said that the last human dies a long time ago and while this is an over statement ( I hope ) it does raise the question of the kind of personality constellations the ancients possessed. What were the original Greeks like from whom we have drawn so much? I gather they looked the same and were as intelligent but how were their brains wired together? It appears that many had a personal intensity we can scarcely understand today. 4. To have a developed society we want certain behaviors to be suppressed because they disrupt that development. A person might have any idea as long as they did not ACT on it or communicate it as this is a type of observable action. The question as to whether a person is “responsible” or not or is even capable of a free choice is a strategy we employ in order to insist on individual accountability so that society and its leaders can be spared scrutiny. Deviancy is then purely a personal matter. It is simply an assertion. The actual facts to the degree that they can be known are only the basis for a legal process entirely concerned with the state of mind of some person during a past event. Were they responsible for their actions? This is a worthy study for neuroscientists for technical reasons but it is the behavior that we need to suppress. 5. In some ways you seem to be a sort of missing link between the Underworld and the Surface. Please consider a complete genetic study and all pertinent scan such as the MRI and so forth. We need to know how you are wired. Like a person with statistically improbable blood chemistry you may produce a treatment. Mental Illness is a plague as you know and you may have some identifiable basis for your partial immunity. Sorry it’s taken me so long to respond. The film is indeed incredibly powerful. I finally had time to watch the whole thing. While I don’t agree that “harm reduction” is evil, or even necessarily misguided, I think it’s great to expose the horrible ugliness of final-stage addiction. Yes, scare people away, by all means. Before their own lives are so devastating that they scare themselves away. These images (and the music!) can do it like nothing else. I hope it’s possible to advocate the benefits of recovery — by far the best solution — without being moralistic and ideological about it. What do you think?